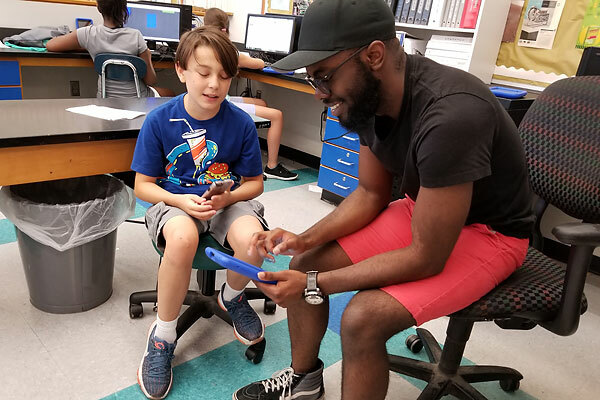 UMass Lowell published a feature article on the CS Pathways project, entitled Computer Science Prof Helps Middle Schoolers Develop Apps for Social Good. The article discusses apps created by students in our two 2017 summer camps. including apps for “MARV,” the Medford Arts Resource Vehicle, and apps to promote learning of the history of Everett. Fred Martin (4th from left, wearing a tie) at Autodesk Design Computing Symposium. Lilli Smith, the symposium organizer, is 4th from right. Project principal investigator Fred Martin was an invited presenter at Autodesk Design Computing Symposium, a full-day event held on November 16, 2016 in Las Vegas, NV as part of Autodesk’s annual conference. The Design Computing Symposium focused on ways that computing is changing how we conceive, design, and create in our world. Martin presented CS Pathways’ vision of democratizing computing by empowering middle school students to create mobile apps. His presentation situated the CS Pathways project in a 50-year history of educational computing research. Martin highlighted how students’ apps, while simple, build community in the classroom. He demonstrated two apps from students’ school-year work: The Motivational App, which speaks positive affirmations to the user, and Languages4u, in which students recorded themselves saying “hello” in their home languages. Two student apps for building community in the classroom: The Motivational App and Languages4u. Both apps were developed by students of Denise Salemi, who was the technology teacher at the Keverian School in Everett during the project’s first year. Martin’s 20-minute presentation was professionally video-recorded and may be viewed at this link: http://au.autodesk.com/au-online/classes-on-demand/class-catalog/classes/year-2016/class-detail/dp23097#chapter=3.